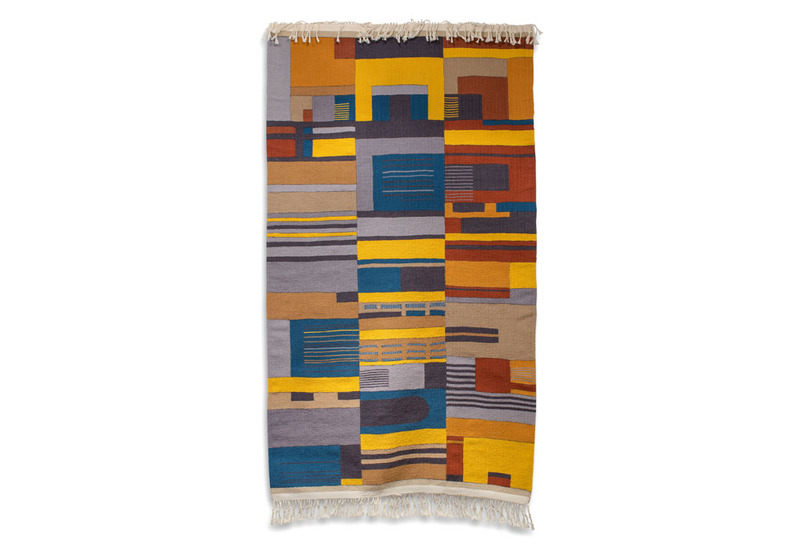 Sue Spooner makes flat weave tapestry in rich hand-dyed wool or silk, woven on a horizontal foot power loom. She specialized in sculpture and printmaking at Cardiff College of Art, but started experimenting with textiles and weaving during a Post Graduate year at Goldsmiths College. After two years teaching in London, she set up her textile workshop in Stithians Cornwall, helped by a Crafts Council Grant in 1975. In 1978 she was awarded a South West Arts Major Award and began to work professionally. 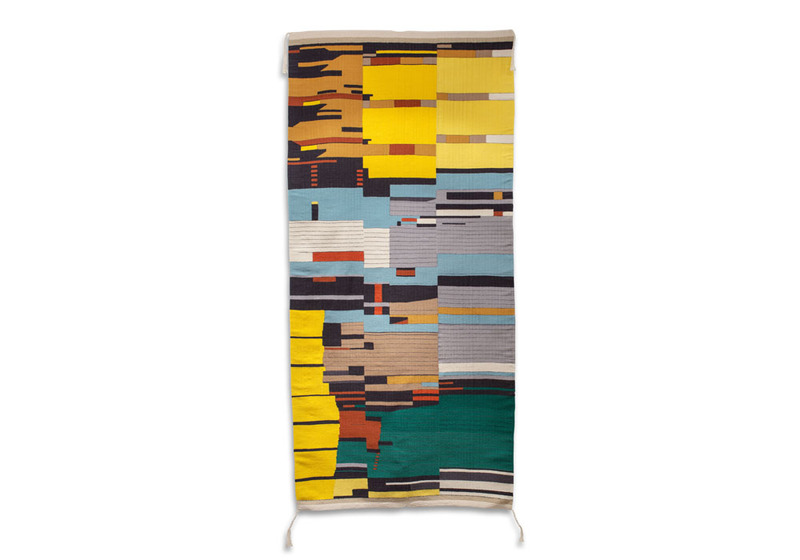 Weaving tapestries and cloth from ﬁne yarns she designed and made intricately woven and sewn coats and garments, combining ﬁgurative shapes with stripe and geometrical pattern. Inspiration came both from North African and Oriental textiles and from the forms which grow naturally out of the structure of woven cloth. 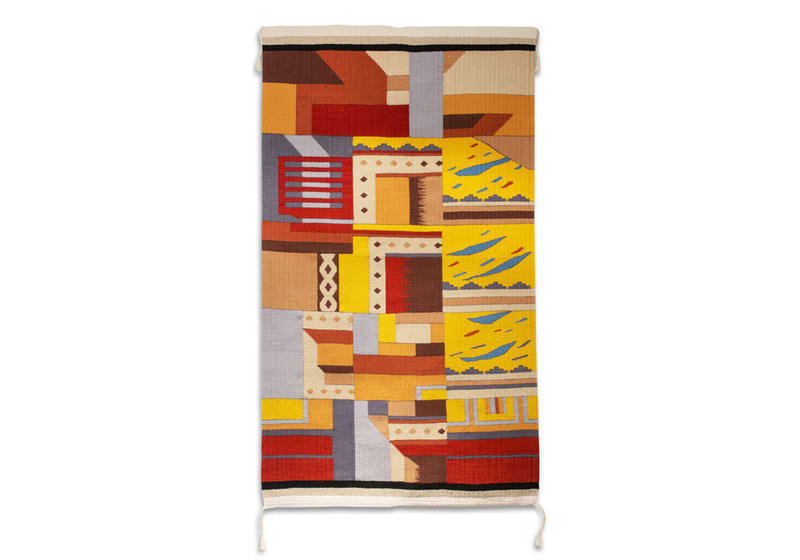 Eventually, not wanting to be tied down by the processes of weaving cloth and garment cutting, her work became more experimental, and concentrated more on tapestry-making directly. The change freed her from former constraints, so that the primary concerns of her ideas and innovation would not be limited by traditional techniques. For the past few years she has produced large and small scale hangings, rugs and framed pieces as each idea dictates, and as one piece of work progresses from the last. 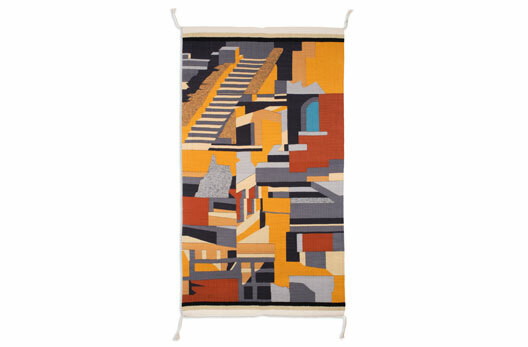 The weaving of each tapestry can be a labour intensive process, usually taking a long time to complete. The image is methodically and mathematically constructed, being gradually worked from bottom to top on the warp skeleton. There is little chance to change a previously woven part of the image without unpicking back to that section. The nature of the process and material has to dictate the nature of the resulting image, but Sue still likes to allow for accidental and unconstrained effects to occur and for the piece to change and develop as the colours and shapes grow within the overall structure. She always feels a sense of anticipation and excitement when she unrolls a ﬁnished tapestry as it comes off the loom to be seen in its entirety for the ﬁrst time. Sue prepares and dyes her own yarns specially for each piece of work, using dye recipes she has built up for many years, colour matching and grading according to the effects she wants to produce. 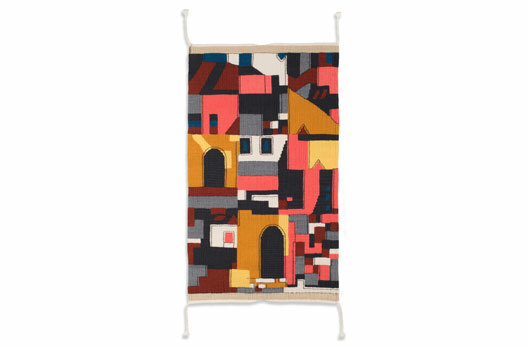 Sue Spooner’s woven tapestries draw their imagery from the built landscape, ancient and historic, where deserted buildings have undergone a process of decay, coloured with rust and verdigris or corroded by the course of time. She has worked and reworked images from the landscape and industrial archaeology of her local area of Cornwall, as well as areas in Cyprus, Crete and San Francisco. 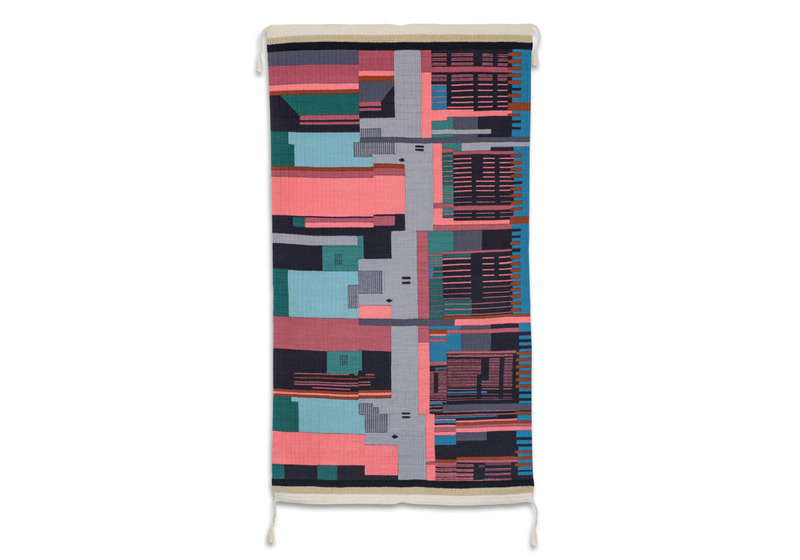 The rebuilding of these emotive inﬂuences in the weaving, to make something new and vibrant, becomes for her an increasingly important way of interpreting what she sees and understands, and how her thoughts can be made into something concrete.